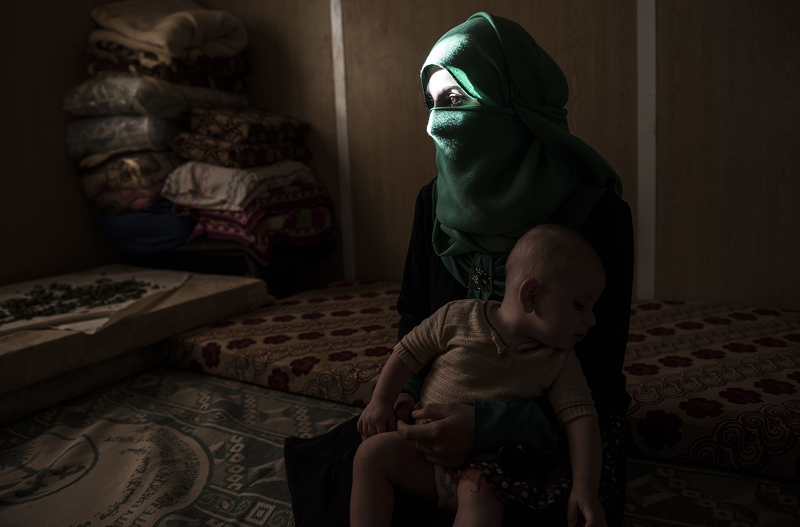 Yasmeen, 16, poses for a portrait with her baby months after leaving her abusive husband and returning home to live with her family at the Zaatari refugee camp in Jordan, August 27, 2014. Yasmeen was married off to a 34 year-old man when she was fourteen years old, and from the first week they were married he abused her physically and psychologically, leaving her covered in blood, and with choke marks around her neck. "I expected it would be paradise," Yasmeen said referring to the marriage "..I never expected he would beat me. I knew from the first time he hit me that the future was over." While marriage under the age of eighteen was a common Syrian tradition before the start of the civil war, more and more Syrian girls are marrying at a younger age because of the insecurity of the war, because many families feel the girls in their family may be sexually harassed if they are not under the care of a husband, and because of prospect of alleviating the financial burden of one more mouth to feed.